LUCKNOW| Showing valour and determination, reflecting the true spirit of Indian Air Force (IAF), Flying Officer Neha Gurnani, saved the life of three passengers who had met with a road traffic accident on highway near Air Force Station Memaura. 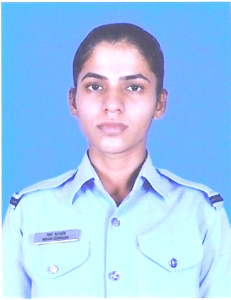 Flying Officer Neha GurnaniFlying Officer Neha Gurnani, who is an Indian Air Force officer undergoing Basic Course in Air Defence College, Air Force Station Memaura was on her way back from Lucknow when she found three injured personnel lying in pool of blood. No assistance was being extended by any passing vehicle or people gathered around. On assessing the gravity of situation, the Flying Officer took immediate control of the situation. Using her presence of mind, she persuaded the owner of a Scorpio parked nearby to take these mortally injured personnel to nearby medical post within Air Force Station Memaura where they were attended by Senior Medical Officer Flight Lieutenant Mitul Singh. The three passengers – Vinod, Sarvesh and Kishan of Khatola Village on their Passion Pro Bike had sustained injuries which were life threatening in nature. On preliminary examination, it was found that Sarvesh, one of the injured, had severe head injury, dropping BP and no pulse. Due to timely medical support provided in the form of first aid and critical basic life support in first golden hour of injury, three lives could be saved. After stabilizing, Flt Lt Mitul Singh and two Indian Air Force medical personnel moved the patients in their state of the art ambulance to King George Medical College. Enroute one of the patients suffered two seizures, was given Cardio Pulmonary Resuscitation and revived. The precious lives of these three people could only be saved due to timely and prompt action by Flying Officer Neha Gurnani and Flight Lieutenant Mitul Singh.